This condo was beautiful and very comfortable. The staff was friendly and very helpful. We had an amazing time and will definitely be staying here again! Excellent location, cleanliness was good, Wonderful views. Saw Dolphins on several different times. Elevator was not an issue. Shower in master bath was wonderful. Master bedroom was nice. Sleeping was not a problem. Entrance and exit to the property was convenient. Carpet is badly worn. Arm chairs also need a good cleaning. Definitely would stay here again for the price and location. We loved our condo and the location of it. Very convenient to everything. Would not mind staying there next year. Would have liked nicer weather but it was a lot warmer than home. Condo was well appointed, extremely well equipped and very clean, which we appreciate. Clearly the owner has anticipated the needs of the tenants. Thanks for a wonderful stay. Convenient to excellent restaurants, lovely State park and interesting walking areas. Definitely a five star condo. Beautiful condo, and wonderful amenities. We want to book it again. Very clean, unit as advertised. Nice, comfortable furniture, well equipped kitchen, comfortable beds. Great unit in a really nice condominium complex. My husband and I just returned from a two week stay. We absolutely loved this condo. The view was amazing. It felt like we were looking out of the front of a ship.The balcony was really big. We were totally comfortable in every way. Everything was provided to get you started for your stay. We would love to come back again! Nicely decorated condo with unbelievable views of the Gulf. I highly recommend staying here as it has everything you need... comfy beds, plenty of high quality towels, laundry room with washer/dryer, the decor is stunning, outdoor seating on balcony, a fitness center, pools, racquetball and tennis courts, and more. We travel a lot and rent in many places... and we own our own rentals in other areas... and I have to say that the property management company did an amazing job with communication and cleanliness and the owners have provided a high quality condo. Spacious and beautiful condo with a spectacular view! We loved it!! There was a variety of shopping and activities to do within a short distance of the condo. Check in and check out was fast and easy! Third trip to Eagles Nest was the best ever! New living room furniture, new coffee pot, and kitchen drawers all labeled were nice surprises. Beautiful house. Plenty of room. Great location! HIGHLY RECOMMENDED. Stayed for 3 weeks and loved every minute of it. Condo was decorated beautifully. The views are amazing. Loved the amenities and convenience of the beach and The Cobalt, Happy Hour is awesome, took advantage of that often. Definitely will be back. This was a great condo for our party of three couples. We had almost everything that we needed, however, we did a lot of cooking and I wish there had been more containers for left overs. Enjoyed our stay. Very clean and well maintained. Had everything you need for a short or extended stay. Would definitely recommend this property. Had one question for the owner. Sent him a text and he responded promptly and solved my issue. Our 3 week stay went all too quickly. This condo exceeded all of our expectations! Everything was just perfect, the view, the furniture, the bedding, the dishware, the utensils, the decor, everything was exceptional! There is nothing that I can say it was not perfect about this condo. this was a great place to stay. The condo was very clean and had everything we needed. The location was awesome. Beautiful views of the Gulf with easy access to the white sand beach. The indoor pool and the two hot tubs were a plus, since we were there in February and many days it was too cold to truly enjoy the beach. The area has many restaurants to enjoy a meal out. We also spent sometime in Mobile at the USS Alabama exhibit and in Pensacola, Florida at the air museum. Both were excellent. On a smaller scale we toured Alligator Alley and went to the Railroad museum in Foley, Alabama. The model train setup was awesome to see. If you go, you need to go on a Tuesday or Thursday when the trains are running. It is amazing. Enjoyed the condo and everything was well appointed. The recliner chair needs to be replaced but other than that it was wonderful. Unit was very clean and beautifully decorated. Loved the kitchen but could have used more glasses and utensils. We were very pleased with the parking and felt the whole resort was very safe. Being next to Colbalt is an added plus. Hoping to come back next year! This was the best condo weve rented in the last 3 years! Very spacious and clean. We loved it! We love the location of Summer House. Conveniently located to shopping and restaurants. Light, bright and beautifully decorated. Kitchen had everything needed for meal preparation. It is a wonderful unit, enjoyed it very much. Would love to come back. Only one thing was missing, coffee filters, minor but wanted you to know. This is a wonderful place to stay on the 10th floor. We watched dolphins usually in the morning on their way west and sometimes if we were around in the afternoon returning to the east. Everything is new and very nice. The only thing we missed was sitting in a tall chair on the balcony. If you have tall chairs, you have full view of the gulf without a handrail blocking your view. 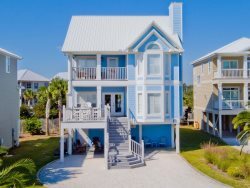 We have returned to Gulf Shores for many years, and this unit had the best accommodations yet!